Every shopper wants their money’s worth that’s why we are looking for items to purchase that are not only durable but have the best deal in the market. I have to make sure that I’m spending wisely on items that I really need in such a way, I still have some money as savings. These days, not only we need to save, spend sensibly but we need to be smart in finding the best deals and bargains that many stores are offering. We just need to be smart in knowing those stores that are currently having the latest markdown sale so we can plan our shopping. Another way of smart shopping is finding the best price of an item that you are eyeing to buy before hitting the store. Thankfully, there are comparison websites that can help online shoppers in finding the best price on different stores where those items are currently available for sale. I recently discovered Save22 Philippines whilst browsing online and trying to find out the price of an item that’s on my shopping wish list. I was more than glad to know the price range of a Canon Powershot camera that I’m hoping to buy soon. Different stores offer their competitive prices and I have all the options to choose where to buy. Since I’m a bargain hunter, it made me think that why should I buy the item on stores that sell them at a higher price when I can get the same item on stores offering them on much lower cost? 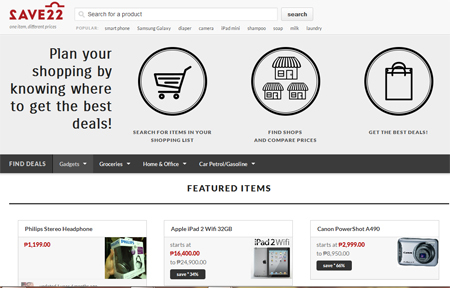 Finding a specific item that you are looking for is easy at their website by using the categories and sub-categories such as gadgets (cameras, laptop etc), home and office, groceries, and more. Clicking on a specific item will show their prices offered at various stores and you can compare prices in an instant so you already have a great idea on prices and where to buy. It can also save you time and money because you don’t need to go to different stores by yourself just to compare prices. A lot of stores are now trying to give the best deal for their items because of the competition among other retail stores and they know that shoppers will really find a way to get the cheapest deal there is.